BMW and General Motors are the car giants that are backing a tech-based on blockchain that wants to share data from self-driving cars. The information would be shared not just between the automakers but the cars themselves. Overall the initiative is a part of the process that aims to unlock the data that is now held in informational silos. Sharing it will allow the vehicles to hit the actual roads sooner. So far, the MOBI or the Mobility Open Blockchain Initiative ventured into these waters. This consortium was created in 2019 so that it can harmonize the development of DLT or the distributed ledger technology in the car industry. Now, MOBI is shifting its focus on the autonomous vehicle data market or the AVDM that is currently chaired by GM. This automaker had blockchain on its roster for some time, and it has even filed a patent late in 2018. It describes how a blockchain system could be used by a fleet of autonomous vehicles. Now, the new manager of the AVDM working group old is Michael Filipowski. This manager of global innovation at GM stated that he is excited to chair this group and begins the development of collaborative efforts with MOBI members and other original equipment manufacturers (OEM). But, the initiative is much more nuanced than this. BMW, who is also a founding MOBI member, expressed interest in the use of data-sharing among its self-driving cars for the first time. Previously, the company tested blockchain tech that was designed to measure the mileage of leased vehicles. Now, the manufacturer from Germany, like many other companies, realized that data from self-driving cars stored in information silos is actually a big barrier standing in the way of widespread adoption. Similar to blockchain and cryptocurrencies, where the interests of bitcoin are practically the same as any other digital currencies, car manufacturers have an aligned mission – get the autonomous vehicle on the road. This is valid from the perspective of both the technical aspects and the legal ones. This is why BMW created positions like blockchain lead. Currently on that position is Andre Luckow, who stated that the blockchain technology offers decentralized data management. Furthermore, it can be applied in a manner that is both efficient and privacy-preserving. The same usefulness of the tech extends to the future as well. Here Luckow can see the possibility of blockchain being aided by decentralized machine learning, decentralized data markets, and multi-party confidentiality computing, all of which are expected in the decentralized and autonomous age. In the immediate future, self-driving vehicles have a key hurdle in this domain – the volume of data that self-driving car produces. It has to be consumed and categorized in some way to allow the operators to figure out how vehicles need to behave in different scenarios and places. The nature of the car use dictates this. While driving around on a test track comes with a very predefined environment, a busy city center with its numerous moving and stationary factors is a completely different ball game. 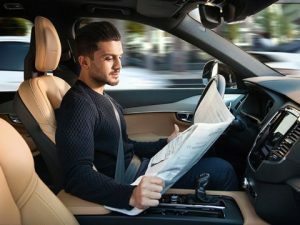 A recent report from the Rand Corp showed that getting to a point where autonomous vehicles are safe in all regular road conditions would require hundreds of billions of miles that these vehicles traveled. The data from these vehicles would come from their on-board camera and Lidar, which is a system of detection similar to radar, but which uses light from a laser source. Using the data from all companies that use the autonomous vehicle in open road testing seems like a logical step, but many companies in the same branch believe that this data is one of their crown jewels. However, experts believe that the very opposite is true. One of the representatives of the MOBI approach, Sebastien Henot, explained that the old-fashioned way of thinking is not true anymore. The idea that data of a company is very precious is partially true but the notion that it should be forbidden to others is actually a self-haring decision. Instead, using blockchain allows for the creation of an environment where the process of sharing is transparent and efficient. This will let the companies decide the rules of who gets to see what instead of believing it was all or nothing type of process. Ocean Protocol, another MOBI member, is creating data markets and using a shared AI that is working on them. Its team wants to unlock as much data as possible for shared use without having the jeopardize the companies in any way. At the same time, even this AI is decentralized. All of this points towards the option of having almost the entire ecosystem set up in a decentralized manner. Waymo is the self-driving tech company that is owned by Alphabet, Google’s partner. It is further along when it comes to data collecting than almost anyone else. Like in esports, for example, having strong partners for a venture is essential in autonomous driving as well. Yet, MOBI representatives are doubtful that anyone, including Waymo, could get to the finish line on their own. This is the strongest possible call for shared data – if every company goes at it alone, the strongest among those would still need hundreds of years of test data with this pacing. A counterpoint in this discussion is the notion that Waymo itself is promotional – data does not have to be actually collected on the physical roads. Instead, it can be generated from the computer simulations of the same process. Similar to many other industries, the tug of war between cooperation and competition is relatedness in self-driving cars as well. But, at the same time, there is a strong sense that slowly, companies are crunching the numbers and realizing, one by one, they will not be able to push this process on their own. At the same time, there is a growing sense that autonomous vehicles are good to go, quite literally. This realization comes with numerous concerns and data security is probably the biggest among them. After decades of frantically trying to protect their data, big companies are not expected to share it and this is kind of a mentality paradox. But, it is also one that will certainly be overcome by the companies being that is an essential need to advance their shared cause.